A look back over history shows that there are certain periods in time during which innovation and cultural change dramatically increases. 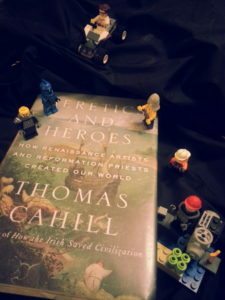 The book Heretics and Heroes: How Renaissance Artists and Reformation Priests Created Our World is the sixth volume of Thomas Cahill’s The Hinges of History series in which the events of these critical periods of western history are documented and retold. Heretics and Heroes focuses on the cultural and religious upheaval in Europe during the sixteenth century. Divided into seven sections with a prelude, introduction, intermission, and postlude, the book highlights various innovative ideas and concepts that arose during the Italian Renaissance and the Protestant Reformation. Woven throughout the text is a nod towards the “centuries-long game of philosophical tennis” being played out behind the events themselves. This game, as Cahill outlines in his prelude, is between the Platonic-Augustinian and Aristotelian-Thomistic schools of thought on how reality is perceived. During the time period covered by Heretics and Heroes the Platonic-Augustinian view of reality (i.e. that the “phenomena of our world…leads us to the absolute realities…[of] Beauty, Truth, Justice, Unity…and…Goodness” ) becomes the dominate view over and against the Aristotelian-Thomistic view (i.e. that “there is no world of Forms beyond the world we know and see” ). In a very practically manner, I can see myself paying more attention to the art around me and the meaning being conveyed through the art. Prior to reading Cahill’s Heretics and Heroes book I had never paid attention to the deeper cultural and philosophical context and meaning of an art piece. Rather I would just see the picture itself without looking any deeper. Now, however, I am curious as what other secrets are lurking behind the canvases and sculptures of the Renaissance and other time periods. Thomas Cahill. Heretics and Heroes: How Renaissance Artists and Reformation Priests Created Our World (New York: Nan A. Talese, 2013), 7. Thomas Cahill. Heretics and Heroes, 5. Thomas Cahill. Heretics and Heroes, 6. Thomas Cahill. Heretics and Heroes 105. Thomas Cahill. Heretics and Heroes, 182. Thomas Cahill. Heretics and Heroes, 305.